Sunday March 18 sees the return of the F1 circus to Albert Park in Melbourne, Australia. It will also be the first time without Michael Schumacher for 15 seasons. The lead-up to this meeting has not been dramatic, in that no team has been showing dominance. And even more importantly, no driver has been showing dominance in any team. World champion Alonso is not quicker than his new rookie team mate Lewis Hamilton at McLaren, laughing boy Raikkonen is no quicker than Massa at Ferrari, Kubica no quicker than Heidfeld at BMW, and Webber and Coulthard seem to be about as slow as each other, taking it in turns to be close to the bottom of the pre-season testing time sheets in the new Red Bulls. This all-new Red Bull F1 Adrian Newey designed vehicle seems to be the biggest disappointment in the 2007 series cars, showing neither pace, nor reliability. 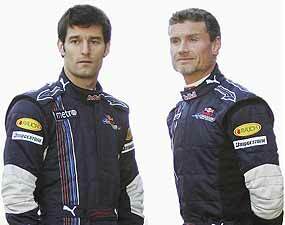 Much was expected of the car, looking at the pedigree of the designer, who has penned many championship winners, but unless something like a two second lap time improvement is found between now and March 18, do not expect to see Webber, the Aussie home hero, on the front row (or anywhere near it). McLaren have been looking much better than they did at this time last year, so 2007 could be a good year for them, whilst Renault have only been mid-field runners at this stage. Ferrari is, as you would imagine, up near the top of the time sheets in testing, and I believe you will see good solid drives coming from both Massa and Raikkonen. However, testing is only testing. The proof of the pudding will be seen at then end of one and a half hours racing at Albert Park on the 18th. So to last week. The world’s first half-tracked vehicle to traverse the snow was built for the Tsar of Russia. I asked when was this? Clue: Kegresse. Kegresse was the engineer who came up with the rubber half-track belts and fitted them to the Tsar of Russia’s vehicles. Dates are given variously as between 1902 and 1909. So to this week. The name Cooper is famous in motor racing. When and where did a Cooper first have its overseas success? Clue: it was in Asia. Pizza Company to rival Red Bull? The involvement of the Pizza Company in motor sport in Thailand is now very deep, encompassing Formula BMW, sedan car racing, go-karts, and even a scholarship scheme for up and coming junior drivers. The scholarship was decided after a traditional ‘shoot-out’ formula, but the young hopefuls were not just judged on speed, but also on race craft, attitude and commitment. The drivers were very close, and at the end of the day after all the tests, the judges still had three drivers whom were equal on most points, but they all agreed that 10 year old Wautier Khan just had that little special thing about him and he was awarded the 2007 scholarship. Wautier Khan is a Thai national with a Belgian father and a Thai mother. He is now having his team racing wear made up so that he will be in full team race colors when he joins his first race in Pattaya on the 11th of March in the Mini Rok class. Italkart is having a brand new 2007 frame flown in from their factory overseas, which he will be racing in during 2007, and the importer of the Mini Rok engines is currently preparing his brand new engine for collection next week. Paul Kenny, CEO of the Minor Food Group, told the press that he did not expect young driver Khan to go and win first out, but that it was important for him that Khan got the proper teaching during the year, and grew with the task as the year went on, and he wished him all the best. 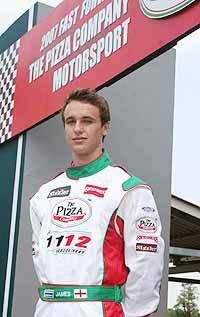 Another recipient of Pizza Company sponsorship is James Grunwell, a young driver who did well in his first year in a world series, competing in Formula BMW. Last week the Pizza Company confirmed continued support for Grunwell in the 2007 FBMWA season, after he came second in the Thai National Go-Kart Championship. Thomas Raldorf (L) and Paul Kenny (R) with Wautier Khan. Official testing for BMW begins in March with the first race in May at Sepang. Formula BMW returns to Thailand in June for the second round at Bira International Circuit. Meanwhile, the ‘original’ Pizza Company Race Team of Paul Kenny, Thomas Raldorf and Martin Stuvik, who competed in the Toyota Vios series last year, has decided they enjoyed the experience so much that they have all moved up a category into the Toyota Yaris one-make series for 2007. Having been a guest driver with the Pizza Company Racing Team for the Four Hour Endurance race in January, I am looking forward to having a drive in their new vehicles as well. More on this another time. In the meantime, if you think you would like to experience the thrills of sedan car racing, it is possible to have a drive in the Pizza Company racing Vios vehicles. More details on this by contacting Thomas Raldorf on 081 929 1940. The team also offers corporate events, where they take company staff or customers around the track as passengers, and if requested, also let some of them drive themselves. Bookings for events like these have to be made minimum three weeks in advance, and can only be on Saturdays or Sundays. The officially world recognized Bangkok International Motor Show kicks off at the end of this month, running from March 30 through to April 8. Held again at BITEC (Bangna Km 1), this is the largest show of its kind in the ASEAN region, and a tribute to the foresight of Grand Prix International’s Dr. Prachin Eamlumnow, who has been the guiding force behind this motor show for the past 28 years. With well over 1.6 million visitors, it is definitely popular with the masses. There is parking within the BITEC grounds as well as parking areas on LaSalle Street for another 4,000 vehicles. If you are coming by public transport, then go to On Nut Skytrain terminal and catch one of the 10 shuttle buses going to BITEC. Many concept cars and concepts in new technology are promised for this year’s show, including automotive directions in making this a ‘green’ motor show. Alternative energy sources will be on display as well. The main halls are of course for cars and pick-ups, but there are also halls for motorcycles, heavy machinery, auto equipment and after-market gear for off-road activities as well as the usual go-faster modifications and another hall for sound systems.